Revel in every creamy, cheesy bite of our VELVEETA® Egg and Veggie Bake. 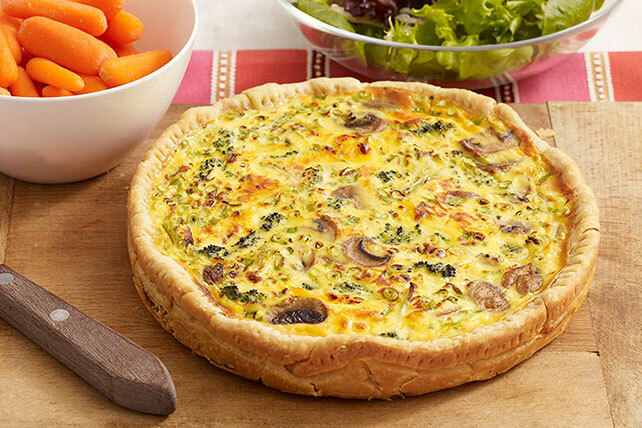 This wonderful egg and veggie bake is bursting with mushroom-broccoli goodness. Cook broccoli and mushrooms in skillet sprayed with cooking spray on medium heat 8 to 10 min. or until broccoli is crisp-tender, stirring occasionally. Remove from heat. Line 9-inch pie plate with pie crust; fold over and crimp edge. Whisk eggs, dressing and milk in medium bowl until blended. Stir in cooked vegetables, VELVEETA and onions; pour into crust. Bake 40 min. or until center is set and top is golden brown. Let stand 10 min. before cutting to serve. Save 40 calories and 4g fat, including 2g sat fat, per serving by preparing with 2% Milk VELVEETA and MIRACLE WHIP Light Dressing. Serve this delicious easy-to-make entrée with a mixed green salad and cooked carrots to round out the meal. Substitute a 2-qt. casserole for the pie plate.